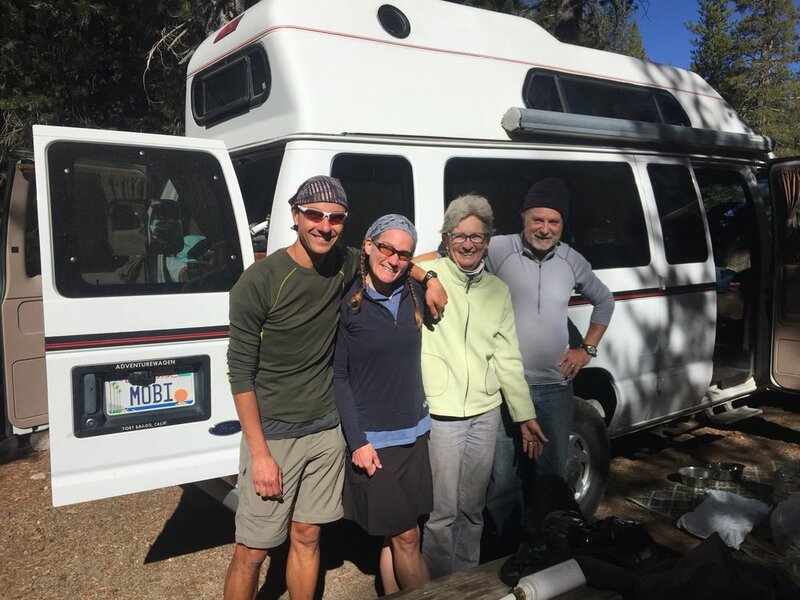 We had been hearing about Brad and Vicki for years from mutual friends but had never had the occasion to meet until our thru-hike took us over Sonora Pass near their home. In addition to being rock climbers and general outdoor people, they are also PCT hikers. 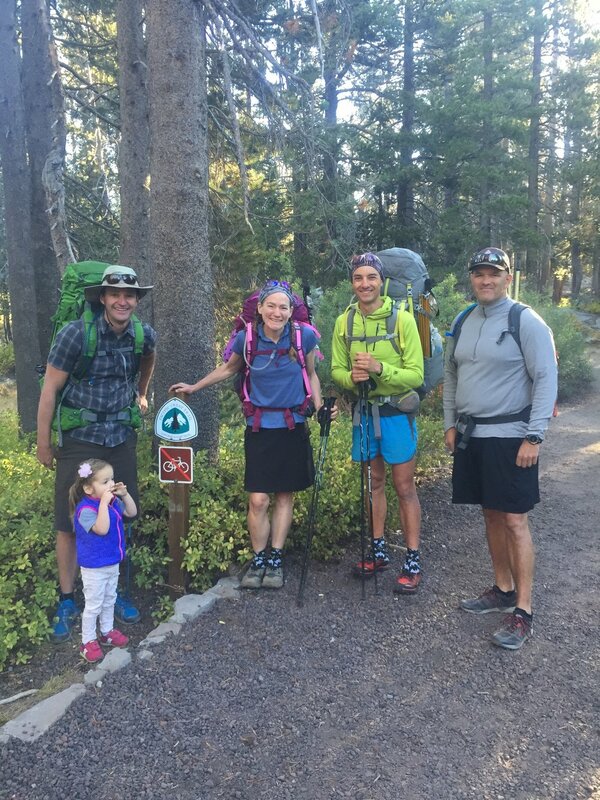 Their family started a northbound hike at Campo the day after younger daughter Tricia's 5th birthday, and every year since then they have made progress along the trail. This summer, before she started high school, they hiked 350.0 miles (yes, they keep track to the decimal point) ending at Hwy 62 south of Crater Lake about a week before we came through. They are on track to finish the trail at Manning Park before Tricia heads off to college. The walls around their dining table hold large maps charting their progress and are covered with pictures of trail highlights from various seasons. Not only was it great to be sleeping inside given the day's wet and cold weather, but it was also fun to stay with new friends that have so much PCT experience. We found several packages from friends (thank you!) along with our regular resupply, and devoured both fresh cherry tomatoes and brownies before heading off for showers and to start laundry. They had a boot dryer for our shoes, spare clothes for us to wear while ours were in the wash, a WiFi password, and welcomed us to make ourselves comfortable and eat anything we wanted. What more could a couple of thru-hikers want? Around the dinner table we all discussed the weather and Vicki kindly offered that we could stay another night (or longer) if we needed to wait out the storm. By the morning of Day 79, the day's forecast had not changed much: high temps in the 30s with a moderate chance of snow showers, and accumulation of less than 1". The following days would be clear and gradually warming but still colder than average through the weekend. It was tempting to stay in this comfortable home another day but knowing we have a long way to hike through the Sierra wNevada we were reluctant to waste any days of reasonable hiking weather this late in the year. When Brad dropped us off at the pass around 9:30am it was clear and sunny but the air temperature was 33F and the wind was brisk. From Sonora Pass the trail makes a steady climb up rocky slopes through a combination of switchbacks and long ascending traverses until it reaches the crest of the Sierra Nevada. Several small rivulets were frozen solid and the creeks had large sheets of ice along their edges. We were happy for the bright sun and clear skies, but stopped a few times as we climbed to add more layers against the biting cold wind until we were both wearing nearly every piece of clothing in our packs (barring our thick down jackets). The conditions kept us moving other than brief stops for photos of the dramatic terrain and amazing views of peaks in every direction. These exposed slopes held small patches of low grasses and alpine wildflowers, all surrounded by tiny drifts of snow from yesterday's storm. Patches of dwarfed and windswept Whitebark pine also managed to eke out an existence in these harsh conditions. There were no other signs of life on the otherwise stark rocky ridgelines. The trail meanders high along these ridges for several miles, staying between 10,400' and 10,800' in elevation. Larger rocky prominences glittered in the sun with a fine sheen of fresh snow and ice. The wind remained strong and we braced ourselves with trekking poles as we walked, especially when crossing over saddles where it threatened to knock us over. In this barren landscape, we were especially appreciative of the beauty in the rock itself and when we crossed over into the basin containing Latopie and Koenig Lakes we were stunned by the contrast of the deep blue and green water against the surrounding rock. The trail stays high above the lakes, and soon we were over another saddle and onto the next ridge with only more rock and occasional patches of Whitebark pine to keep us company. Distant peaks stretched out in every direction, and many had a fresh dusting of snow. We saw a hiker far below us early in the day and passed one hunter near the trail junction to Leavitt Lake but otherwise had the trail to ourselves on this cold day in late September. By late morning clouds started building in the sky and as we started our long descent from the high ridges into Kennedy Canyon it looked positively stormy. We could see the exposed trail switchbacking up towards Emigrant Pass and were glad to pass that junction and follow the PCT into stands of taller, more protected Whitebark pines as we continued to drop in elevation. The creek in upper Kennedy Canyon was the first water source in miles, and we stopped there in the protected forest for an early afternoon break. The wind was much less fierce but still had a cold edge, and by the time we were getting up to go it looked like rain. No layers were removed. Cookie came along and we caught up briefly before hitting the trail, having not seen her (or any other SOBOs) since she passed us near Five Lakes Basin the evening of Day 73. Fun Fact: Whitebark pines (Pinus albicaulis) are the dominant tree species at the highest elevations in the Sierra Nevada, and survive where other trees wouldn't dream of living. Although they often take a low and almost shrub-like form at these elevations they are one of the longer-lived pine species and even specimens that are only 3' tall may be up to 1000 years old. This 5-needled pine has small and tight cones that do not open on their own, so the species is dependent on the Clark's Nutcracker to distribute the seeds for propagation of new trees. Intact Whitebark pinecones are rarely found on the ground, but mature trees are usually surrounded by chewed cores, scattered bracts, and red-purple pollen comes. On our walk through forested Kennedy Canyon we had a few views of surrounding peaks. The clouds moved fast above us and as the sky grew more ominous the more distant peaks were obscured by sheets of visible precipitation. By the time we reached Walken Meadow the sky was solid grey overhead and a light snow started to fall. Cookie caught up with us again and we walked together as we discussed planned destinations for the night and Sierra weather patterns this time of year. She hoped to reach Dorothy Lake and that seemed like a reasonable campsite to us, so we decided to stick together for the rest of the day. 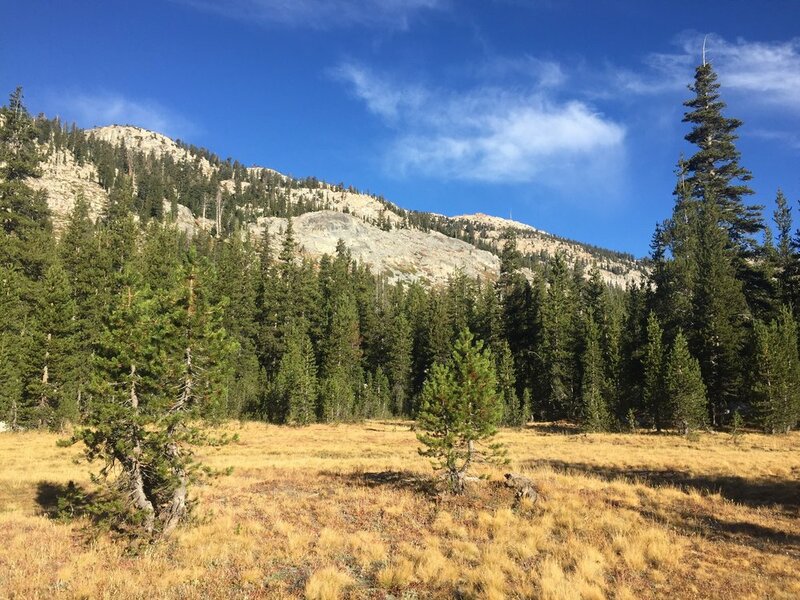 The main topic of conversation in SOBO circles for several weeks has been the Sierra Nevada, and what the weather might do in this section that is famous for its beauty but also much higher in elevation and more remote than anywhere else on the PCT. We are not as nervous as most, since we backpack nearly every year around this time in our home range. Our packs hold enough clothing, food, and gear to get us through most conditions we might encounter, and we are familiar with exit route options via lateral trails along the length of the PCT/JMT throughout the Sierra should things get worse than expected. Of course, we prefer good conditions and are well aware that fall weather in the high elevations is unpredictable and can change rapidly. In any case, Cookie was glad to join us in the snowstorm, and we were happy for her company. We walked through classic Sierra terrain of white granite and Lodgepole pines under a steady snowfall for about an hour. It was plenty cold, but at least the wind had disappeared and it felt like we were on the set of a holiday card. I'll take a calm snowfall over the combo of sleet, hail, rain, and driving wind we had coming down from Sonora Peak any day. Once we started hiking with Cookie, we all exchanged updates on fellow SOBOs as word of mouth is a major way we hear of others' progress. She had crossed paths with Grim in Sierra City and even camped with him one night. He is apparently moving fast with an aggressive daily mileage as his Triple Crown is in sight, so it seems unlikely we'll see him again. It was also fascinating to compare our own progress with Cookie's since we last saw her. We discovered this to be a perfect illustration of how two hikers can be very close for days but never cross paths unless one of them stops at a town or sets up camp early. The day we talked to the trail runner who saw Cookie at Richardson Lake, we figured she was 4-5 miles ahead of us. We walked a little late that evening and camped at Fontanillis Lake, while she stopped earlier and camped at a tarn between Fontanillis & Dicks Lakes, probably only a mile or so beyond us. The next day we started late and hiked a short day to Echo Lake where Becky picked up Bryan and brought our resupply. Cookie started early and pushed on south of Hwy 50 that day, though when we compared notes about the myriad day hikers and casual backpackers we passed coming out of Desolation Wilderness it was clear we'd seen many of the same people. We passed her when she spent the night in Markleeville. The day we hiked to Sonora Pass in the afternoon she camped early in the upper reaches of the canyon along the East Fork Carson River with concern for the changing weather. It was interesting to hear that by staying on the north side of that saddle she had rain on her tent but not bad and nothing worse, while we walked through a wet and windy wintry mix of driving rain, sleet, and hail across Sonora Peak just a few miles beyond. She hiked to the trailhead the following morning, and met the guy from Sonora Pass Resupply to purchase a bear canister probably just minutes after Brad dropped us off and we hit the trail. She was most likely the hiker we saw far below us as we climbed to the Sierra Crest on the south side of Hwy 108. With all of these near misses, we hadn't seen each other for 6 days! Another interesting tidbit was that she stayed in Truckee with friends the same night we spent with Becky and Bryan. She had camped at Peter Grubb Hut the night before, while we hiked to I-80 from White Rock Creek, so she was picked up at the highway before we arrived. The next morning her friends dropped her off early at the Donner Pass trailhead and she decided to spend a little time taking advantage of good cell service before starting to hike. While she was talking to her parents she saw us pull up in Bryan's truck. As we got out, she told her parents it looked like a few thru-hikers. But then she saw Bryan who didn't seem thin enough and didn't quite have the look, and Matt got out carrying only a daypack and then she wasn't sure what to think. She spent quite a while on her phone in the parking lot, which is why we didn't see her until near Tinker's Knob that day. Also, we learned that when she passed us setting up camp with Bryan at Five Lakes Creek that night she noticed that Matt wasn't there. Thinking he had just fallen behind, she assumed we were making very slow progress and figured she probably wouldn't see us again! The trail has such interesting dynamics, and it was fun to learn all of these details. It seemed especially fitting since we met her parents at Hwy 36 long before we ever crossed paths with her. As we were approaching Lake Harriet we passed the PCT 1000-mile mark, indicated on the ground near the trail by rocks arranged to show the numbers. It seems crazy that we now have less than 1000 miles left to hike, and verging on insanity that this sounds like a relatively short distance to both of us. Three-digit mile markers are a novel concept, but I suppose we'd better get used to it. I think we're settling into this thru-hiking thing. Near Lake Harriet we passed a handful of tents and spoke to a few backpackers who told us that SOBO thru-hikers Cinch and French Fry were at Dorothy Lake trying to get a helicopter evacuation due to illness. None of us had met the pair, but we'd seen their names in trail registers just ahead of us and hoped that it was nothing serious. We crested Dorothy Lake Pass at dusk, entering Yosemite just in time for some magical evening light on Forsythe Peak and the rocky slopes around the lake as we made our way to the far shore and found a campsite by headlamp. We didn't see anyone else camped around the lake and assumed that the helicopter Macro had seen earlier in the afternoon may have already picked up the sick hikers, or maybe they recovered enough to walk on. The clouds had completely dissipated and while the stars were brilliant, the air was bitter cold and we made quick work of camp chores and dinner before diving into our sleeping bags in an attempt to stay warm. The wind started back up sometime during the night and remained strong, shaking our tent and making it difficult to sleep. Cookie had decided to join us for the next few days of hiking and our plan was to leave early in the morning on Day 80 to make up a few miles since we had hoped to get a little further from Sonora Pass on our first day out. The sub-freezing temperatures and howling wind slowed our start, though we were still on the trail before 6:45am. We were all motivated to move and made good time through forested Jack Main Canyon, past frosty undergrowth and over frozen patches of ice on the trail. By the time we reached Wilma Lake the sun was out and the wind had diminished to a breeze. While it was still a crisp and cold day, it was such a treat not to have any apparent threat of precipitation. Given yesterday's short mileage our night's destination was Smedberg Lake, under 30 miles from Dorothy but still an aggressive goal given the high elevation, significant vert (~6500' of climbing), and rocky trail. Fortunately the surroundings were stunning and we had Cookie's good company to help the miles go by. Macro and I have made countless backpacking trips to Yosemite including some in the far northern reaches of the park. This was Cookie's second visit to Yosemite, and first time to this region. She was surprised there weren't more hikers on the trail (we ended up not seeing another person all day), in such a beautiful place. 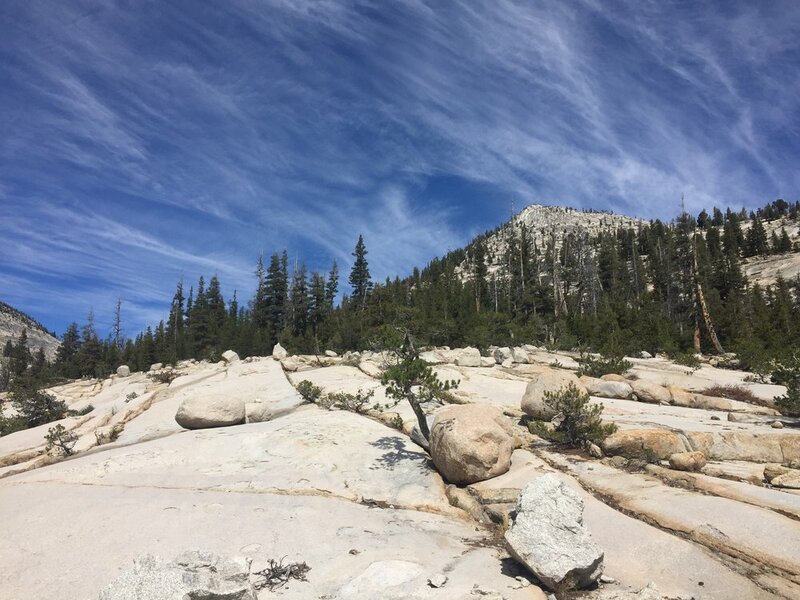 We all enjoyed the dramatic scenery and perfect blue Sierra sky as we climbed over grey and white granite slopes from one canyon into another, through stands of huge Western white pine with their giraffe skin-like bark on one slope and majestic Western Juniper loaded with berries on the next. We stopped for lunch near a very pleasant creek in Stubblefield Canyon before climbing once more to drop into Kerrick Canyon. From there it was a welcome change to make a long gradual ascent hiking alongside the stream in this lovely canyon after crossing so many in rapid succession earlier today. Just before the headwall we turned and made the steep ascent up the side of the canyon to reach Seavey Pass, marking our last canyon for the day. It was late in the afternoon and we still had significant climbing ahead of us, so we hurried down the long descent towards Benson Lake and Piute Creek. We started our final 2000' climb to Smedberg Lake as the sun was dipping below the ridges and casting alpenglow on Volunteer Peak near our destination. Once again, we found a campsite by headlamp and dined like Argentinians in the cold night under the stars. We were all looking forward to meeting our friends Hillair & Michael at Tuolumne Meadows tomorrow, and making our goal of Smedberg Lake tonight meant that this was still a reasonable plan. A southbound hiker came in after us by headlamp (thru-hiker behavior, for sure) and set up camp a bit further along the lake. We called out hellos and expected to meet in the morning but he was up and gone before us and we didn't pass him on the trail. Last water? Cookie decides to grab a refill in that case. Day 81 was cool but just a bit warmer than the day before, and the three of us welcomed this trend as we hit the trail around 6:45am despite our very late night. We hoped to send a message with our ETA, but even at the top of Benson Pass had insufficient cell signal to do so. Today's walk was much easier than yesterday's and still plenty scenic as we went through Matterhorn, Cold, and Virginia canyons and had lunch on the sandy shores of Miller Lake set on a high plateau in between. We enjoyed the transition from Whitebark pines at the highest elevations to Mountain hemlock and Lodgepole pines in the canyons, and remarked at the fall colors of golden grasses in the meadows with red and yellow undergrowth. As the day wore on the sky filled with wispy clouds, non-threatening but quite beautiful. We had a constant light wind though it was hard to complain given the generally pleasant hiking temperature. We stopped at Return Creek for water and all shared a laugh at "last H2O" spelled out in rocks on the shore, since it was less than 8 miles to the next water source at Glen Aulin. It is great to be back in the Sierra Nevada, where 8 miles is a long enough stretch between water sources that it merits a warning! By late afternoon we had reached Glen Aulin, where we started to pass many backpackers and a handful of late day hikers. We stopped many times along the cascades to take pictures in the low angle sunlight, and ended up talking to some poets from Santa Barbara headed our direction. The older of the two was 73 years old and was quite a character. When asked if the two were related (we thought they might be father and son), he told us that yes, but only because they were both Homo sapiens. After hearing that we were hiking to Mexico from Canada, he told us that he would probably hike until he reached the Pacific Ocean, cross over to Russia then descend into the interior where he would visit his people. Since he was carrying nothing but a nearly empty Sierra Club promotional daypack that looked like it had just come out of the package, it seemed more likely that he was headed to his car at the trailhead, but we all got a chuckle out of his reply nonetheless. We finally had a shred of cell service as we neared Hwy 120 and were able to call Michael to tell him we were less than a mile away as dusk faded into dark. Hillair walked out to meet us along the highway and we were so glad she did, as the Tuolumne Meadows campground was bustling on the last weekend it was open and it would have taken us forever to find their campsite by headlamp without her guidance. She told us that Pitbull was already here, and had stopped by after seeing the note she left for us at the trailhead earlier in the day. We introduced Cookie, who had been a bit nervous about showing up unannounced, but she had nothing to worry about as Hillair and Michael immediately welcomed her and were happy to share the site and their feast. And what a feast it was. We started with nachos covered in cheese, shishito peppers, and tomatillos and moved on to sourdough bread from Arizmendi (a favorite bakery near home), fresh green salad, soba noodles, and grilled salmon from Fort Bragg. Not to mention corn on the cob and several bottles of stout. A dinner fit for thru-hikers indeed. While we were eating Pitbull came over from the backpackers campsite to say hi, and although he had already eaten it wasn't too difficult to coerce him to sit down and have a little more food. He had news of many SOBOs and we learned that he and several others had arrived into Kennedy Meadows North (on Hwy 108) just ahead of the storm and had stayed an entire day to wait it out. With this delay, many were worried about making it to pick up resupply packages at the Tuolumne post office before it closed for the season today. Pitbull and Decaf were the only ones who seemed likely to reach it in time given their hiking speed, so they collected IDs and signed affidavits from all 6 and set out on the 3-day push for Tuolumne to make it here by 5pm today. Just before noon this morning they passed a hiker who told them the PO would actually close at 2pm, and they still had 11 miles to go. Pitbull offered to run the rest of the way if Decaf could carry both packs and sprinted down the trail with just his water bottle, phone, and SPOT device. His running background paid off because despite the high elevation he made it there before closing time and was able to claim all of the hiker resupply packages that had already been marked "return to sender" in anticipation of the seasonal closure. After all of this effort, Pitbull didn't even have a resupply package of his own to claim. He was planning to hit the trail tomorrow while Decaf would stay another day to watch the IDs and boxes, and each day another SOBO arrived they would take over the watch until the next one came in, until all were claimed by their rightful owners. He also told us that French Fry had indeed been airlifted from Dorothy Lake, and Cinch had been hiking like mad to reach Yosemite Valley where he hoped to be able to contact her and obtain transportation to wherever she had been taken. Given the timing, it seems almost certain that it was Cinch who came in late to Smedberg Lake and left early this morning. No word yet from either of them. Also, people have been worried about Stringbean who called his girlfriend a few days ago saying he was exhausted and cold and has not been seen by other hikers since. Many thru-hikers carry minimal clothes and gear to save weight, and their strategy for the Sierra is to hike fast and camp at the lower warmer elevations. Especially heading into the mountains this late in the season, we are all keen to look out for each other and it was good to hear where other SOBOs are in relation to us. We will keep an eye out for Stringbean and look forward to hearing he is OK. Before Pitbull left for the backpackers camp, Hillair and Michael pulled out the final course of the evening, Straus vanilla ice cream with olive oil and sea salt! They apologized that it wasn't soft serve, though I think it may have been even more delicious. It was a chilly night, but never too cold for a little ice cream in my opinion and others must have agreed because we all emptied our bowls around the dwindling campfire. Macro and Cookie are overwhelmed by breakfast spread at Tuolumne. And a tablecloth! We somehow managed to make a respectable dent in this morning feast. Our amazing resupply team at Tuolumne Meadows. Thank you Hillair & Michael! Before heading to bed, we made a plan that Hillair and Michael would meet us again at Red's Meadows in a few days so we can split our long resupply and enjoy their company once more before they head home. Cookie decided to stick with us for that distance, as she planned to take a rest day and resupply in Mammoth anyway and is one day ahead of her own schedule after our last few long days. Pitbull is hitting the trail early in the morning with some aggressive days planned to resupply next at Vermillion Valley Resort. We hope to see him down the trail, and it could happen. We were touched by all of the treats sent with Hillair & Michael by other members of my ceramics studio collective - cookies, cheese, chocolate, fresh garden tomatoes, and more chocolate. All are like solid gold to thru-hikers, and we appreciate these thoughtful contributions to this amazing journey of ours. Not only have we entered the comfort zone of our home mountain range, but we have also entered a section of our hike that is well-supported by fantastic friends, and we couldn't be happier for this perfect combination. If we can share even a little of their generosity with a few other good SOBOs, all the better.